WASHINGTON, D.C. -- Today, NOAA christened a new, state-of-the-art research vessel that will enhance the study and protection of Flower Garden Banks National Marine Sanctuary in the Gulf of Mexico. 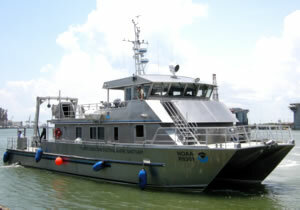 The 83-foot R/V Manta will operate out of Galveston, Texas, where the sanctuary is headquartered. Built in Bellingham, Wash., by All American Marine, the twin-hulled Manta features a laboratory equipped with the latest scientific instruments, air compressors to allow divers to refill scuba tanks at sea, and a recompression chamber to enhance diver safety. The vessel can hold up to 25 people, deploy robot subs and other ocean exploration tools, and cruise at speeds up to 35 knots. In addition to being a platform for exploring the sanctuary and surrounding waters, the Manta will also serve as a patrol vessel to enforce sanctuary regulations and a floating classroom. Teachers will be regular visitors aboard the Manta to watch and learn as scientists conduct research. Located 115 miles off the Texas/Louisiana coast, Flower Garden Banks National Marine Sanctuary is one of 14 marine protected areas managed by NOAA’s Office of National Marine Sanctuaries. The sanctuary includes the two northernmost coral reefs in the continental United States, sponge communities, and other habitats.